Sunday, December 31, 2017, Beginning at 6:30 p.m.
Let go of the old and attract prosperity and auspiciousness for the New Year. 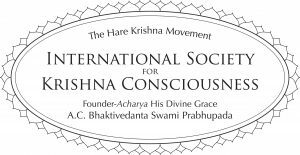 On Sunday, December 31, 2017, beginning at the 6:30 p.m. arati, and continuing to a Maha Arati at midnight, enjoy an evening of Krishna bhajans led by our talented and enthusiastic musicians. The evening will include an auspicious fire yajna at 7:30 PM. 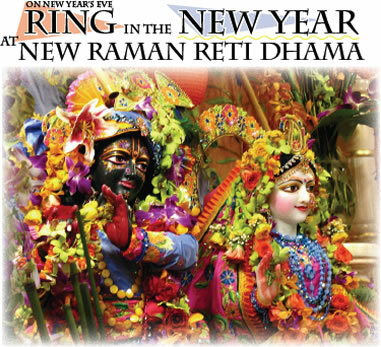 Write down your New Year’s resolutions, an offering from your heart, to Sri Sri Radha- Syamasundara, Sri Sri Gaura Nitai, and Sri Sri Krishna Balarama and offer them on the altar. All resolutions will be presented to Their Lordships throughout the night. Light prasadam will be available starting at 9:00 p.m. Then at midnight take part in the Maha Arati. Invoke auspiciousness through the power of the Holy Name. New Year’s Eve harinama downtown Gainesville, 8:00 -10:00 PM, please join in!